I’ve talked before about your “reputation” as a mailer (with large inbox providers, such as Gmail and Yahoo), and how important that is. Here’s another aspect to think about: the more sophisticated mailbox providers also look at the interaction you have with your subscribers (their customers). That is, is it all passive? Do your mailing recipients look at your mail? Do they spend time with it, or just delete it? And here’s where passivity comes in: do they only read it, or do some percentage of them respond to you? That’s one reason, by the way, you want a real address in your “From” line. It shouldn’t be “DoNotReply@example.com”! You can set up a specific address to send “from” or you can use your real, everyday, address (which is what I do). And then I actually encourage readers to reply. You may have noticed I do that when I send out Emailified Briefs: I specifically say you can reply with questions! This is Randy, the founder and author of This is True. You subscribed to my mailing list yesterday, and I want to be sure that you got the welcome that was sent after your subscription and confirmation click, since that is a big indication of whether you will get the newsletters. So I’m asking you to just reply to this to let me know you got this. Really: just click reply and let me know, whether you are a brand new reader or a long time subscriber who just changed your address. That way I can see the patterns of what mails are getting through… or not. Also, this is a reminder for you that you can reply to any issue to comment on a story. Thanks, and don’t forget to hit reply and let me know you got this. Feel free to include comments if you wish because I do indeed look at the replies. Cheers! And yes, I really do look at every single reply. It’s a reminder that they subscribed while it’s still fresh in their minds. They signed up for my list, and here’s what a mailing looks like, and they can expect more. That means they’re much less likely to mark future emails as spam. It’s a reminder that they can reply to any newsletter. Note that it gives them something extra for free: as I preach here, I want to ensure every message that they get on my list has value, and this one is no exception. It encourages them to hit Reply and send me some sort of message now and then, which just further helps with my reputation score, and often gives me some content to make my newsletter better. As for this particular message, sometimes readers blow it off. Others simply hit Reply and Send, without typing anything. (And that’s OK! Their provider still sees it as interaction.) Others tell me how they heard of my newsletter, or say they were a subscriber years ago, and ran across something that reminded them of me, and they thought they’d check and there I was! And sometimes they send great testimonial material that I can use for promotion, or (again) other content that makes my newsletter more interesting. I call it my “engagement” message, since it encourages ongoing interaction, and gives a personal touch to “just a mailing list.” I usually go through the messages once a week, and that only takes 5-15 minutes. Most don’t need any sort of reply, and those which do usually are very brief. The bottom line: it’s really worth the small amount of time. 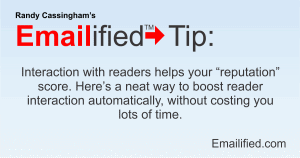 I actually haven’t done this yet on the Emailified list, but here’s the nifty thing: I can add it to the sequence anytime I wish, especially when I get around to offering some sort of report or other value add that I want my readers to get. And once I do add it, it will do its job by itself “forever” (until I change it). All in all, it’s something you should also consider adding when you get a chance.